Zu Forbes has a complicated relationship with love. Her mother died when she was a teenager, leaving her with a lonely father and emotional baggage. So at the earliest opportunity she switched the baggage for luggage and took off around the world. But now she's home and working for a dating agency. Can she find the perfect match for her dad? If only she can pair him off, she can run away again with a clear conscience. While Zu busies herself fixing her dad's love life, she almost misses Cupid creeping up behind her. They say it takes ten minutes to fall in love so how can she be falling for someone she's known for years? And why is it taking so damn long to matchmake her dad? Zu must make a commitment one way or the other: to her love life; to her family; and to the memories of a mother she's tried so desperately to forget. Ten Minutes to Fall in Love is an engaging, witty and romantic story about finding that perfect person to share your life. 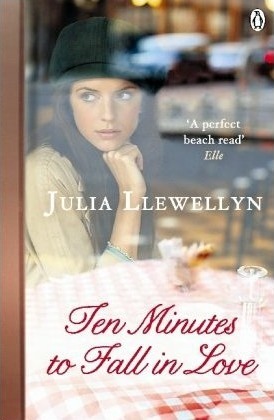 Like all of Julia Llewellyn’s Novels, her latest offering deals not only with romance but with real life issues and problems, perhaps this novel more than others. The story centres around Zu, her father Tony and mother and daughter team Gillian and Holly. Whilst the relationships between these parents and siblings are strained and this makes for quite gritty reading sometimes, there are romantic undertones throughout the book and a full on love story to keep any reader happy. Zu returns from her travels around the world doing charity work to her father’s house and finds herself working for a dating agency who says that it only takes ten minutes to fall in love. In those ten minutes you will know when you have met ‘the one’. Zu doesn’t support this and it seems that none of the other characters in the novel actually do either, so don’t be put off by the title, you don’t have to be a hopeless romantic and believe in love at first sight to enjoy this book! I enjoyed reading this book but found it a bit of a slog at points because of some of the issues that were going on between mother and daughter and father and daughter. Be warned, this is not a light and fluffy offering, some of the things may feel a little close to home, and some of the scenes left me feeling uncomfortable. The love stories at the heart of the book, however, more than made up for the fact that there was some gritty, real-life drama dealt with, and I found myself carried away, willing characters to see the person who was right for them and realise that they were in love! hmm, the synopsis doesn't make it seem so serious and issue-laden, so I'm glad I read your review! This one definitely sounds like something I'd enjoy.